From the mid-'40s through the '50s the Bailes Brothers were among the most popular close-harmony duets. There were actually four brothers -- Kyle, Johnnie, Walter and Homer -- but they seldom worked together as an entire group, instead pairing off for performances. The Bailes were born and raised in West Virginia, near Charleston. Their father, a minister, died when they were young and their impoverished mother had to struggle to keep them together. (Years later, Walter paid tribute to her trials with his song "Give Mother My Crown.") While working a variety of odd jobs during the Depression, the brothers were inspired to pursue music by the songs of such performers as Billy Cox and Buddy Starcher. They started out on a variety of radio programs, but didn't earn much recognition until 1942, when Johnnie and Walter began working as a duo at WSAZ Huntington. 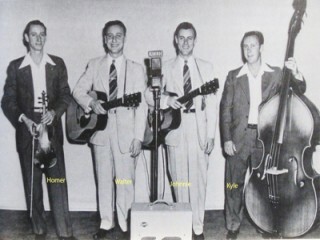 All four brothers played string instruments; after they became popular, they added other members to their group, among them Fiddlin' Arthur Smith. It was Roy Acuff who got the Bailes their big break when he suggested to WSM Nashville executives that the brothers appear on the Grand Ole Opry. They made their debut on the show in 1944 and stayed in Nashville for two years. They made their recording debut in early 1945 for Columbia; among their first singles were their original songs "Dust on the Bible" and "The Drunkard's Grave." As they continued recording the brothers added more and more original songs, such as "Broken Marriage Vows." In 1947, Walter left to become a minister and Homer became the singing partner of their friend Dean Upson. They made their last recordings for Columbia at the end of the year, later becoming co-founders of the famous Louisiana Hayride show. The original Bailes Brothers went their separate ways in 1949. Over the next decade, different combinations of Bailes Brothers appeared. In the early '50s Homer and Kyle teamed up to work at a Little Rock, Arkansas station. They also recorded a single. Later Johnnie and Walter reunited and began singing gospel in Texas. In 1953, they recorded three singles for King; Johnnie also cut a few solo records. During the 1960s, they continued the pattern, with Walter teaming up with Kyle and Homer at different times. Johnnie and Homer reunited during the early '70s, and from the mid-'70s through the '80s Walter, Kyle, and former band member Ernest Ferguson frequently played at churches and sometimes at festivals. Homer was busy working as a pastor while Johnnie ran three radio stations. Walter was also an evangelical preacher. In 1976 Walter and Kyle made an album; in 1977, all four reunited for a record, joined by their sister Minnie on a few cuts. After, Walter recorded on his Starlit and White Dove labels, while Homer also recorded solo. Much of the Bailes Brothers' early works are available on anthologies, and some of their records have been re-issued. View the full website biography of The Bailes Brothers.